Images in the pre-built WordPress sites (called Inspirations) can be royalty-free or require purchase for use. 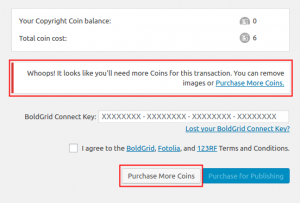 When you use an image with a watermark, then it will require purchase using the BoldGrid Connect Coins before you can use the image without a watermark. You will not be charged for an image until it is saved within a page or post. As you add images, you can see the total number of coins in the cart increase. Where do you find the images to purchase with BoldGrid Connect Coins? BoldGrid adds a tab to the Media Library called the BoldGrid Connect Search. Here you can search for images that you may want to use for your site. Log into the BoldGrid dashboard. Click on Media in the menu at left, then select the BoldGrid Connect Search tab. Click on the Search field and type in a description of the image you’re looking for. 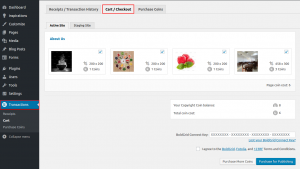 Click on the check box for Attribution in order to search for non-copyrighted images. Once the images have been found, they will be displayed. Click on the image or images that you want to use. When you click on the image you will see the cost in copyright coins appear in the right column. When you click on the different image sizes you will see a blue box appear representing the image size. You will also see the different cost in coins depending on the image you select. Images that you select here will not be charged to your account until they are saved into page or post in your BoldGrid site. You will need to go to the Transactions menu and then click on the Cart/Checkout tab. You will see the images that you have selected that require payment. You will also see your balance in coins. 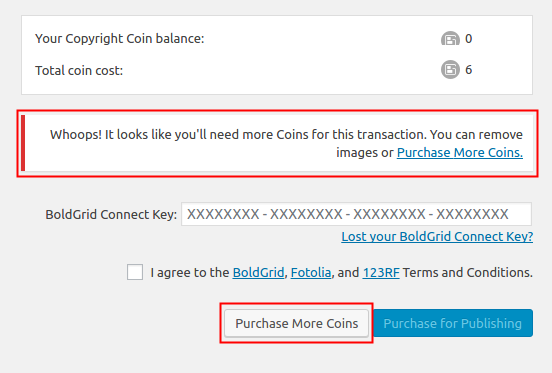 If you have enough coins to purchase the images, you will need to click on the checkbox to agree to BoldGrid and Fotolia’s terms and conditions. After you have clicked the checkbox, you will need to click on Purchase for Publishing in order to complete the process. If you require more coins, you will see a message indicating that you need to purchase more coins. You will need to click on Purchase More Coins at the bottom in order to proceed. This will take you to the Purchase Coins tab. 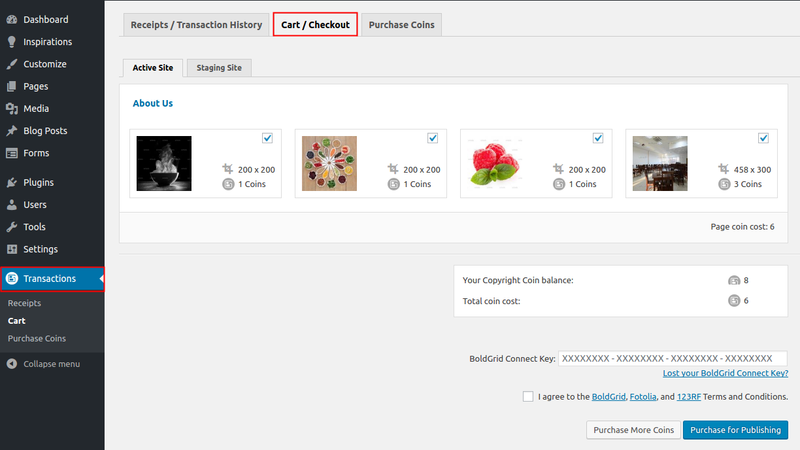 When the order is approved, you will see the total number BoldGrid Connect Coins updated in the Cart/Checkout tab of the Transaction section in the BoldGrid Administrator.